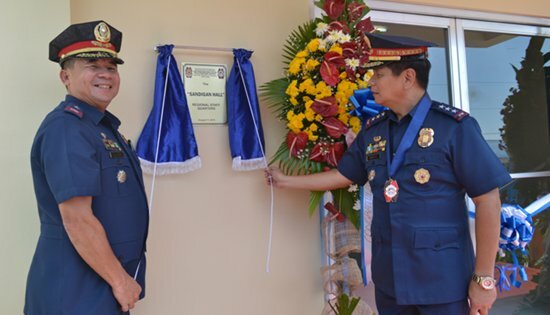 PDDG Felipe L. Rojas Jr., the Deputy Chief PNP for Administration and PCSUPT Henry P. Losanes, RD PRO8 leads the Inauguration of PRO8 Regional Staff Quarters during the 113th Police Service Anniversary on August 11, 2014 at Camp Kangleon, Palo, Leyte. CAMP KANGLEON, Palo, Leyte – The Police Regional Office 8 (PRO8) celebrates 113th Police Service Anniversary today, with the theme: “Pulisya-Kaagapay ng Mamamayan Para sa Patuloy na Kapayapaan at Kaunlaran”. Police Deputy Director General Felipe Lozada Rojas, Jr., Deputy Chief, PNP for Administration graced the said momentous occasion held in front of PRO8 Admin Building, Camp Kangleon, Palo, Leyte. PDDG Rojas, the Guest of Honor and Speaker presented the awards and decorations to PNP Units and personnel for their outstanding achievements. Individual awardees include: Achievement Award in the Field of Police Administration - PSSupt. Brigido Unay, PD Leyte (Police Commissioned Officer Level) and SPO4 Isagani Medida Villanueva (Police Non-Commissioned Officer Level); Achievement Award in the Field of Police Operations – PSInsp. Raul Tundag Sarabia (PCO Level) and SPO1 Ruel Dianito Subang (PNCO Level); Achievement Award in the Field of Police Criminal Investigation – Psupt. Elmer Beringuel Cinco (PCO Level) and SPO1 Mark Alexis Salazar Ruita (PNCO Level); Achievement Award in the Field of Intelligence – PCInsp. Marben Manaog Ordonia (PCO Level) and PO3 Abelardo Jabonero Llanita (PNCO Level); Achievement Award in the Field of General Support – Pinsp. Yasmin Fevidal Vilches (PCO Level); SPO2 Severo H. Abuda (PNCO Level); NUP Anabella Cobacha Juanico (NUP Supervisory Level) and NUP Jinky Gamba Negrido (Non-Supervisory Level). Meanwhile, police units awardees include: Regional Highway Patrol Unit 8 - Achievement Award in the Campaign Against Organized Crimes; Samar Philippine Public Safety Company - Achievement Award in the Campaign Against Insurgency; Regional Health Service 8 & Regional Crime Laboratory Office 8 - Achievement Award for General Support Services; Leyte PPO, Southern Leyte PPO, Eastern Samar PPO, Northern Samar PPO, Samar PPO, Biliran PPO, Ormoc CPO, Tacloban CPO and RPSB - Plaque of Recognition for Disaster Rescue and Relief Operations. Special Awards – Plaque of Recognition - PSI Karlov Caesar Lobina Camposano and Posthumous Award to PO2 Adelfo G. Lopez. PDDG Rojas, assisted by PCSupt. Henry Losanes, RD PRO8 led the awarding during the said activity. Also part of the celebration was the Inauguration of PRO8 Regional Staff Quarters and the Turn-Over by the Korean Military and Inauguration of Regional Special Training Unit 8 facilities and Opening Ceremony for PNP Scout Class 46-2014. The celebration of the 113th Police Service Anniversary is a major event for the Philippine National Police as it commemorates the evolution of the founding anniversaries from the Insular Constabulary, Philippine Constabulary and the Integrated National Police and now the Philippine National Police. PCSupt. Losanes expresses his appreciation and gratitude to all its personnel for another year of police service. RD PRO8 also recognizes all uniformed men and women who had served with distinction both in the field of law enforcement and anti-criminality, as well as in various aspects of public service. With the PNP’s plan for genuine transformation through its P.A.T.R.O.L. (Peace and order Agenda for Transformation and upholding of the Rule 0f Law ) Plan 2030 and the Chief PNP’s Strategic Focus CODE-P and Beyond, the PNP assures the public that it will continue to provide Serbisyong Makatotohanan and implement all reforms in the organization to provide better police service. PASAY CITY – Senate Majority Leader Alan Peter “Companero” S. Cayetano said he is all for extending the reform agenda of President Benigno Aquino III's administration but not the term of the chief executive. "I have been fully supportive of President Aquino and his administration's 'Tuwid na Daan' reforms and platform of good governance which have led to an impressive economic growth. Moving forward, the Filipino electorate must choose a leader who will continue what the Aquino administration has started," Cayetano said. The Senate leader said Aquino has done more than enough for the country and deserves to enjoy his life with his family when he steps down by the year 2016. The President himself as well as the Palace have said that he is not interested nor favors in Charter Change nor term extension. Aside from its economic gains, the Aquino government also proved to be committed to the principles of transparency and accountability by stopping the abuse of public funds and putting powerful politicians-turned-alleged plunderers behind bars. "Choosing the next chief executive in the 2016 elections will be crucial. It will determine if we will continue to move forward or go back to a GMA type of governance where protest and instability were constant because of widespread corruption," he said. Cayetano also stated that while criticisms against the present administration are good to the extent that they serve as check and balances, ideas and proposals on how to help Filipino families cope with everyday problems should be prioritized. "And I see the Aquino government's sincere desire to do just that. But if we truly believe in President Aquino, we should not endanger his legacy by putting a corrupt official into power," he said. "Huwag tayong magpabulag sa matataas na ratings at political propaganda. Magkakaroon lamang ng peace of mind ang Pangulo kung alam niya na ang susunod na presidente ay ipagpapatuloy ang kanyang mga reporma." QUEZON CITY – The Trade Union Congress of the Philippines (TUCP) strongly opposes any move that would implement a four-day compressed workweek scheme and daylight savings time to conserve power proposed by Department of Energy Undersecretary Jose Layug Jr. amid the looming power crisis in the country. “The DOE’s failure to have a policy on power security and competitive rates directly led to this crisis. How dare the DOE now try to impose labor policy? Why will workers sacrificed to answer for the policy failure and lack of forward planning of the Department of Energy? When did workers become the safety net to assure high profits for power generation and Meralco? ", said Louie Corral, TUCP executive director. “And besides, sagad na sa kakatipid ng kuryente ang bawa’t pamilya dahil ito na ang pinakamataas na halaga ng kuryente sa Asia, papano pa sila magtitipid? Have they lost all decency? Is this their idea of the social contract of our government with its people? Their cavalier treatment of the SONA directive to consult and their easy conclusion of who must pay the price speak volume about what we can expect from the both of you during the DOE leadership,” he added. In this power crisis, all must bear the burden and all must sacrifice but Petilla apparently does not seem to share this sentiment. Instead of time-bound and transparent multi-sectoral consultations, Petilla is very quick to dump the burden on worker while he insensitively undertook negotiations for expensive power barge rentals. Petilla apparently do not understand correct sequencing. “President Aquino told him during SONA to consult first but he interprets this as "let's make a deal!" he added. TUCP spokesperson Alan Tanjusay explained that a compressed four-day work week may mean workers will have no overtime for extra hours of work. It will also be stressful directly affecting the health of workers. For daily wage earners, it would mean one day less of wages. Tanjusay reiterated the call TUCP made with the Nagkaisa labor coalition in April to President Aquino to convene a multi-agency, multi-sectoral task force to generate a national response and work towards solutions-- a clear policy on power supply, price and a coherent strategy out of the crisis. He said the DOE failed the consumers by not applying a full options approach which would have nipped the crisis in the bud or minimized its impact. The DOE, he said, rather contently sleepwalks from crisis-to-crisis applying one band aid solution after the other but what they really did was surrender the real power policy making to Meralco and to the generation sector actors – neither wants a secure power supply or a competitive rate. This is the call made by Senator Alan Peter S. Cayetano to his colleagues in the 16th Congress as he rallied support for the Iskolar ng Bayan bill which he said would provide quality education to almost 80,000 students every year if enacted into law. “This is one issue we could all agree on, no matter what political color you carry: that access to quality education is a right, not a privilege, even at the tertiary level. Let us provide Filipino families, especially the poor, the kind of education that would make their lives better,” Cayetano, author of the measure, said. Senate Bill No. 2275, otherwise known as the Iskolar ng Bayan bill, proposes the government mandates all state universities and colleges (SUCs) to give automatic admission and scholarship grants to the top ten (10) public high school students of their respective graduating classes. It has been approved on third reading by the Senate and has recently hurdled the appropriations committee in the House of Representatives. Under the measure, SUCs are expected to grant free tuition and other school fees to the Iskolar ng Bayan in all SUCs. “According to the latest data from DepEd, there are a total of 7,913 public high schools operating for school year 2013-2014. That is roughly 79,130 students who are sure of going to college if this measure is made law, or 79,130 Filipino families who have a chance of waking up to a better future,” Cayetano stated. Cayetano said the enactment of this measure becomes particularly important now that the PDAF has been abolished by Congress, leaving some 400,000 scholars on their own to fend for their schooling. He particularly cited the experience in Taguig City and its local government’s strong stance against corruption, a policy that has propelled the city to be one of best cities in the country to live in. “In 2010, the city’s scholarship fund was at a measly P5 million while the allocation for garbage collection was P500 million. It was a clear injustice. But when Mayor Lani won her first term, the contract for garbage hauling was cut and the savings was used to fund a scholarship program. Now with P400-million worth of scholarship funds under the LANI Scholarship Program, over 24,000 scholars since 2010 were given the opportunity to go to college and in the process find better and higher paying jobs in the future." “This is how it should be throughout the country. If we want to help Filipinos families have better lives, we have to focus on what is really important. First, let us cleanse our government from corruption; then, let us maximize the benefits of our people. Kapag bawal ang corrupt, bigay todo ang biyaya, mas masaya ang bawat pamilya” he said. The Efren Martires Command (EMC) of the New People's Army (NPA) in Eastern Visayas (EV) today claimed responsibility for the punishment of an intelligence handler of the Armed Forces of the Philippines, as well as inflicting 11 other casualties killed on the enemy side in various guerrilla actions in the region. "The special operations group of the EMC carried out the death sentence of the people's court on Jojo "Jerson" Rafales last August 1 at 5 p.m. in Calbiga, Samar," said Ka Karlos Manuel, EMC spokesperson. "Rafales was a paramilitary CAFGU element and was sentenced to death for setting up intelligence networks in Calbiga, Pinabacdao and Basey towns. He was involved in the killing of activist leader Rodolfo Dagumay Basada in Pinabacdao last June 29, and the attempted killing of another activist, Ariel Dacallos, in Calbiga last July 31. Seized from Rafales was a .45 pistol and two spare magazines." In other developments, Manuel said that the NPA also dealt 11 casualties killed in action on the 8th Infantry Division. "Last Aug. 2, Red fighters of the EMC harassed 21 elements of the 87th Infantry Battalion then on operations in Brgy. Magdawat, Pinabacdao, Samar. The gunbattle raged from 10 a.m. to past 12 noon. Five enemy soldiers were killed in action while the NPA had no casualty. Meanwhile, last July 11, an NPA sniper team shot and killed one soldier of the 87th IB's 19-element "peace and development team" then operating in the same barangay. The NPA harassments were in punishment for the military's various human rights violations in Calbiga and Pinabacdao on top of the people's continuing sufferings in these towns after Super typhoon Yolanda." "Five soldiers were also killed and six wounded last June 17 after a platoon of Red fighters of the Mt. Amandewin Command defended itself when the 19th IB attempted to raid their encampment in the area between Brgy. Hugpa and Brgy. Mahilaum, Ormoc City. There were no NPA casualties in the 50-minute gunbattle. But the following day, the 19th IB battalion commander went to the abandoned NPA camp for photo ops and boasted to the media that the NPA had many casualties, just to cover up their shameful defeat." The EMC spokesperson said the NPA will step up tactical offensives in Eastern Visayas to defend the people from the Aquino government's atrocities. "The people of EV are still suffering after Super typhoon Yolanda but they are now being battered by the Aquino government's Oplan Bayanihan. Thus the NPA is supporting the people's struggle to oust the Aquino regime and fight for genuine reconstruction through revolutionary change. Because the Aquino regime is corrupt, unjust, cruel, rotten to the core and treasonous in the extreme, it is bound to fall like the Marcos and Estrada regimes." 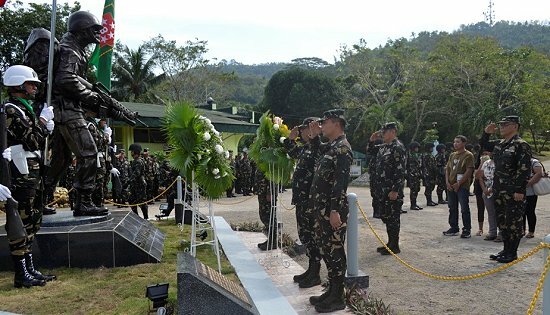 CATBALOGAN CITY, Samar – The 8th Infantry (Stormtroopers) Division, Philippine Army celebrated its 26th Founding Anniversary on August 1, 2014. Gracing the occasion was Lt. Gen. John S. Bonafos, Commander, Central Command, who was also the guest of honor and speaker. The activity was well-attended with the presence of key stakeholders throughout the region. Hon. Sharee Ann Tan-Delos Santos, Governor of Samar; Hon. Mel Senen S. Sarmiento, 1st District Congressman of Samar Province; Hon. Emil L. Ong, 2nd District Congressman of Northern Samar; Hon. Ronaldo S. Aquino, Mayor Calbayog City; Hon Antonio B. Delos Reyes Jr., Mayor of Biri, Northern Samar; Mr. Virgilio DC Galvez, Philippine Information Agency Region 8, Deputy Director General, Mr. Rommel Rutor, President, Stormtrooper Press Corps, PCSUPT Henry P. Losanes, Police Regional Director 8 and representatives from the Republic of Korea Armed Forces. The celebration started with a field mass and was followed by wreath laying for the fallen soldiers of 8ID for the year 2013-2014. Meanwhile, as 8ID celebrates its 26th Founding Anniversary the following are its accomplishment for CY 2013-2014 in performing its mandate as the protector of the people and the state in Eastern Visayas: It has initiated 56 encounters against NPA rebels which resulted to the neutralization of 8 NPA rebels and the recovery of 22 high-powered and 16 low-powered firearms. In addition, it facilitated the surrender of 50 NPA rebels to the government who brought along with them eight (8) high powered and 15 low–powered firearms. Under Comprehensive Local Integration Program (CLIP) of the Office of the Presidential Assistant on Peace Process (OPAPP), the Division was able to facilitate the release of P1.19M benefits for 21 of the surrenderees. Other surrenderees who have not yet received their benefits are still on process and due to be release anytime. In performing its mandate, 12 of our comrades made the ultimate sacrifice of defending our beloved country, while 18 soldiers were wounded in action (WIA) during the same period. The Division was also instrumental in the declaration of 20 of 26 towns of Samar and 21 out of 24 towns of Northern Samar as Manageable Conflict-Affected and Development-Ready areas. By year-end 2014 all the remaining towns are expected to be declared as MCADR. Meaning, peace and order will be stable as NPA influence and presence in the said towns will be minimal and can be adequately addressed by the local governments units thru the Philippine National Police. “With the stakeholders as the partner of the Division in all its endeavors, I am full of optimism that the partnership will hurdle all the challenges that lie ahead,” he added. CEBU CITY – The new camp site of the Ramon Aboitiz Foundation Inc. Kool Adventure Camp (RAFI-KAC) formally opened its doors today with an inauguration ceremony attended by no less than Department of Education Undersecretary for External Linkages Mario Deriquito and Cebu Governor Hilario Davide III. A flagship program of RAFI under its Leadership & Citizenship focus area, RAFI-KAC is the first and only fully dedicated Adventure Education Center in the Philippines. Its mission is to equip organizations and individuals with the character, competence and citizenship to be leaders of change, through powerful learning experiences. What sets it aside from other institutions involved in team building and adventure programs is that they are mostly for entertainment and leisure, while KAC is a whole lot more. KAC started in 1999 and has since conducted over 300 adventure programs to a total of over 10,000 participants for both the youth development programs and professional development programs. "The critical first step towards creating real change in the community is the belief and confidence that you can make the difference. Through specially designed and facilitated learning experiences, all our campers experience personal empowerment and breakthroughs in what they believe they can achieve,” said RAFI-KAC Camp Director Edvan Loh. “Our campers also graduate with strong leadership skills and team values which are tested, practiced and developed throughout the course of our programs. This is how KAC best supports RAFI's thrust of touching the lives of people we serve," he added. Loh leads a competent staff that went through a rigorous training regimen before they were made to handle any program. The training involved Risk Assessment and Management, CRC Safety Standards, First Aid and Basic Life Support, Leave No Trace Outdoor Ethics as well as training on soft skills such Adventure Programming, Facilitation, and Games and Initiatives Leadership. A number of RAFI-KAC’s senior staff members are also certified as Leave No Trace Masters Educator, Kayak Coach and Wilderness Medical First Responder and Challenge Ropes Course Practitioner, and are proficient in Abseiling and Lifesaving, with trainings received in international institutions like National Outdoor Leadership School, Outward Bound Singapore and Project Adventure. RAFI-KAC is likewise an organizational member of the Association for Experiential Education based in the US. Through this affiliation, the RAFI-KAC staff members are able to learn from experts in the field and benchmark with the best practices from all over the world. The new site is located at KM 42 of the transcentral highway in Barangay Cansomoroy, Balamban town, in south-western Cebu. It is about an hour-and-a-half drive to the west from Cebu City via the transcentral highway. “We need to have a permanent location for the KAC so that our target participants will achieve better learning experience from the much improved facilities and new course elements that we are integrating in the camp,” said RAFI Chief Operating Officer Dominica B. Chua, in explaining why the Foundation devoted significant amount of resources in building the camp. In particular, RAFI-KAC’s Youth Development Programs include Character and Leadership Adventure Camps, Land and Sea Expedition Programs, Urban Heritage Backpacking and Eco-Adventure Service Learning Programs. The Professional Development Programs, on the other hand, include Adventure Training & Consulting, Challenge Course Synergy Programs, Leadership & Development Adventure Courses and Corporate Expedition Series. RAFI KAC will also offer the following courses focused on developing more adventure educators in the country: Outdoor Educators Training Course, Leave No Trace - Outdoor Ethics Trainers Course, Adventure Training Course for Teachers and Games & Initiatives Workshop. “These state of the art amenities and adventure programs in the camp site complements our desire to make the Kool Adventure Camp a premier center for experiential learning in this part of the region,” said Chua. She emphasized that safety is a paramount priority for RAFI KAC, which is why it is ingrained in the organizational systems, program procedures and the staff, particularly in the compliance with policies and adherence to protocols, as well as benchmarking with international standards and practices. Local operating procedure and risk assessment and management also guided the programming design to ensure all activities have been approved to be safe for the participants. 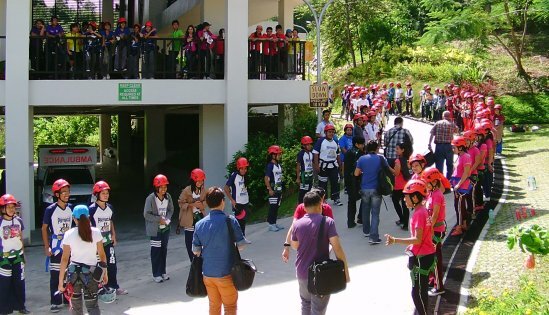 RAFI-KAC’s regular program offering is a three-day, two night challenge ropes course program, but its courses can be as short as a single-day program or as long as a ten-day combined land and sea expedition activity with a service learning component. RAFI-KAC can also fully customize a program to meet the training needs of participants and clients. For additional information, interested individuals and organizations may visit www.kac.rafi.org.ph, or contact RAFI-KAC at (032) 260-9000 local 1001, or email info.kac@rafi.org.ph.